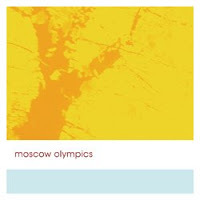 I'm sorry to say I took very little interest when Moscow Olympics' Still 7" was released on Fraction Discs back in December. For some reason I was expecting the kind of 'join the dots' jangle pop that is pleasant enough, but doesn't usually get me that excited. So it came as a huge surprise to find out not only does it sound nothing like Orange Juice, but it's also one of the most exciting debut singles I've heard in yonks. It's got the kind of swirling guitars and atmospheric vocals that suggest more than just a casual interest in early Creation records, plus the kind of euphoric intensity that Asobi Seksu wish they could achieve. I now have to promise myself to never write off a single band ever and listen to every song ever recorded. In other news the train announcer at West Hampstead station sounds just like Aidan Moffett - it's brilliant.